Sewing and textiles have been an important part of my life for many years. On leaving school I started to train to become an accountant but soon realised that this was not the job for me. Looking for something creative to pursue I visited an exhibition of City & Guilds Creative Studies coursework. I was amazed at the beautiful embroideries but thought the course far too artistic for me as I had not studied art and could not draw! I enrolled on the Soft Furnishing Course, something I knew I would be able to do. Incorporating family life and two children, I completed the course in 1996 with a patchwork quilt as part of my coursework. 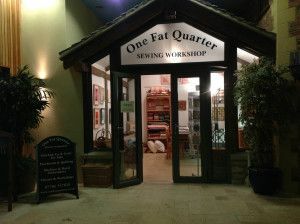 I became part owner of a shop called Two Fat Quarters, in Nailsworth, Gloucestershire. We sold patchwork and quilting fabrics etc and held classes and workshops. After the shop closed, I began to explore other forms of stitching and textile art and went on to complete another City and Guilds, this time in Creative Embroidery. In 2009 I opened my sewing workshop, "One Fat Quarter”, again in Nailsworth, a place for me to work and share my love of sewing. I have been teaching and stitching since then. If you’re wondering about the name… a "fat quarter” is a measure of fabric. A quarter of a metre cut into a fat, square piece instead of a long thin strip. Patchwork and quilting shops often sell fabric in fat quarters. In 2015 I closed my workshop in Nailsworth and am now working and teaching in Cheltenham. My new workshop was part of the Cheltenham Open Studios in 2017. I am still exploring and experimenting with stitch….particularly texture and colour, inspired by the beautiful countryside, from crumbling Cotswold stone walls to the beautiful views, noticing the colour and the mood changing with the seasons and the patterns and textures created by nature over time.